TIME OUT NEW YORK / TONY | SAY WHAT? 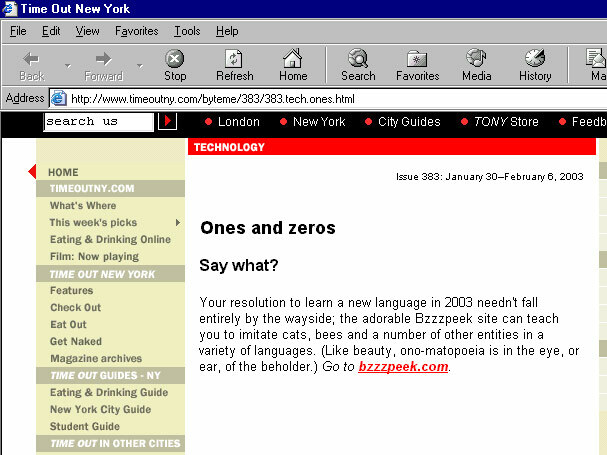 Your resolution to learn a new language in 2003 needn't fall entirely by the wayside; the adorable Bzzzpeek site can teach you to imitate cats, bees and a number of other entities in a variety of languages. (Like beauty, onomatopoeia is in the eye, or ear, of the beholder.) Go to bzzzpeek.com. No printed copy of the issue in our archive – only a screenshot of the online version – detail shown here.